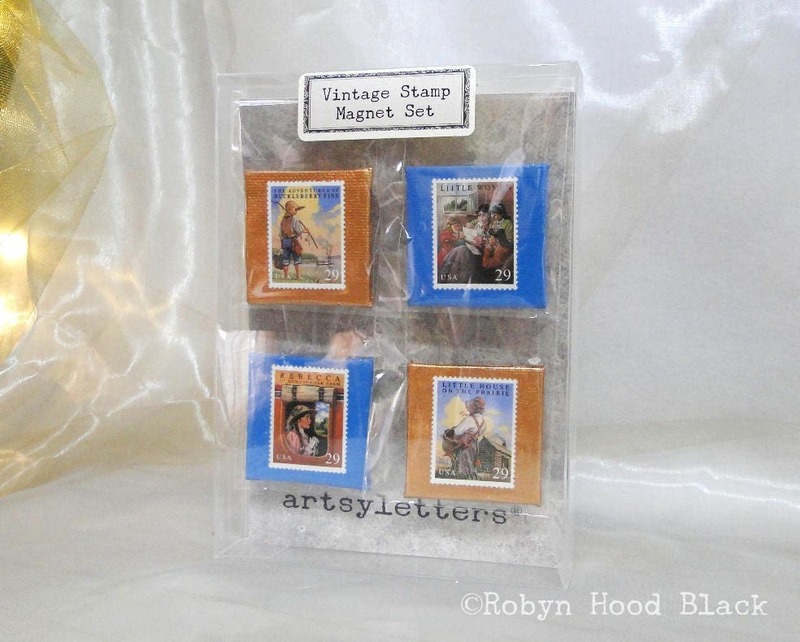 This gift set of four magnets features a series of vintage US postage stamps celebrating Children's Classics. Issued in 1993, the series includes these four stamps: HUCKLEBERRY FINN by Mark Twain (Samuel L. Clemens), first published in 1884; LITTLE WOMEN by Louisa May Alcott, published in two volumes in 1868 & 1869; REBECCA OF SUNNYBROOK FARM by Kate Douglas Wiggin first published in 1903; and Laura Ingalls Wilder's LITTLE HOUSE ON THE PRAIRIE, published in 1932. Each 2" by 2" canvas square board is painted in metallic warm bronze or king's blue, then collaged with an authentic vintage stamp. A shiny acrylic gloss layer covers all, and a 1/2-inch magnetic disc assures your check-out lists from the library will stay on the fridge or filling cabinet. Each magnet is packaged in a clear, archival sleeve and displayed in a clear box for gift-giving. Note: Sometimes the canvas boards have slight variations; each magnet is made by hand. This listing is for one set of four different magnets.